MBC’s Rude Woman is my current must-watch! This show is hilarious! To tell you how “obsessed” I am with it, I’m actually watching the episodes without English subs, which is surprising because for me, doing that requires alot patience. I’ve tried to watch other shows before but would give up after 5-10 minutes into it because it was too boring for me to not understand what the heck is going on. However, Rude Woman is keeping me hooked. That’s how exciting this show is! If you have some free time and are looking for a good show to watch, what are you waiting for? Go check out its thread at soompi.com! There is a lot of information about the show and resources on where you can download the episodes. Currently, there are English subs for episodes 1-2 from WITH S2. Lee Ki Woo (the actor on the left) is a hottie! Well, stop reading this and go check out Rude Woman! Go! 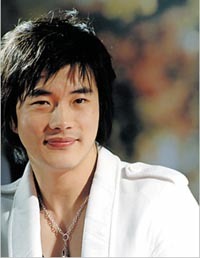 Korean Wave star Kwon Sang Woo has told to a Japanese film magazine he does not plan to get married any time soon. Ahead of the Japanese release of his film Youth Comic (a.k.a. Almost Love), the actor gave a promotional interview to Cinema Today magazine on his goals as he heads into his thirties. “It’s not that I want to put work before marriage, but there just aren’t any plans,” he is quoted as saying. “I want to give better performances, and I am making better work.” He confessed to feeling more comfortable now he is 30. “I have a responsibility as an actor, and I have a little more leeway,” he said. Kwon, who has previously admitted to dreams of appearing in a Japanese soap, named the actor Toru Nakamura, who has appeared in Korean movies, and Takeshi Kaneshiro as two stars he would like to work with. The interviewer swooned over Kwon’s smooth style. “Throughout the interview, he looked me straight in the eye and answered in a gentle and respectful voice, exuding the charm that has captured the hearts not just of Korean women but of Japanese women as well,” Cinema Today gushed. doozy: No plans for marriage yet = more time to grace us with his presence. Yay! In addition to his good looks, I also like his gentle voice (like what the article noted). I bet that it was a good day at work for the reporter who was interviewing Kwon Sang Woo! Can that really be Jeon Ji Hyun? The famously demure Korean star has transformed herself into a rock chick for the Laneige fall cosmetics line of Amore Pacific, evolving into a glamorous power woman. On stage, she shows off her singing ability and smooth thighs, with a newfound energy infusing her every move. doozy: Wow, the first picture of Jeon Ji Hyun is gorgeous! She is one of my favorite actresses.